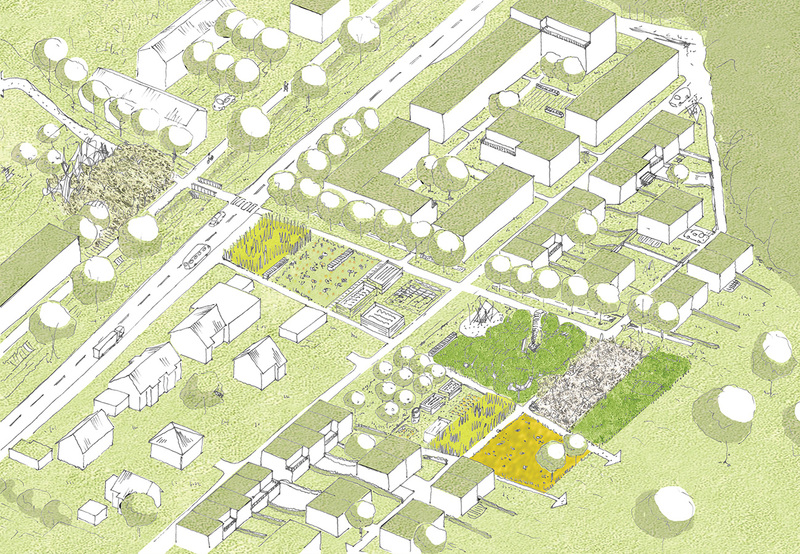 2nd prize in the urban planning competition ” New living in Haintal “, Heidenheim, in cooperation with Koeber Landschaftsarchitektur. Two central open spaces, which take on essential functions but are differently shaped by character, link the new quarter beyond the existing caesuras. 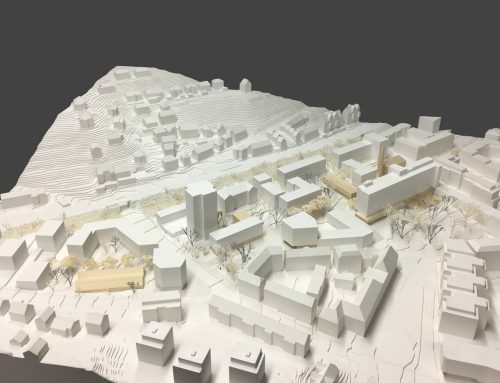 The area to be worked on is located in the east of the city of Heidenheim and is embedded in the landscape of the Haintal valley, which tends towards Giengen. 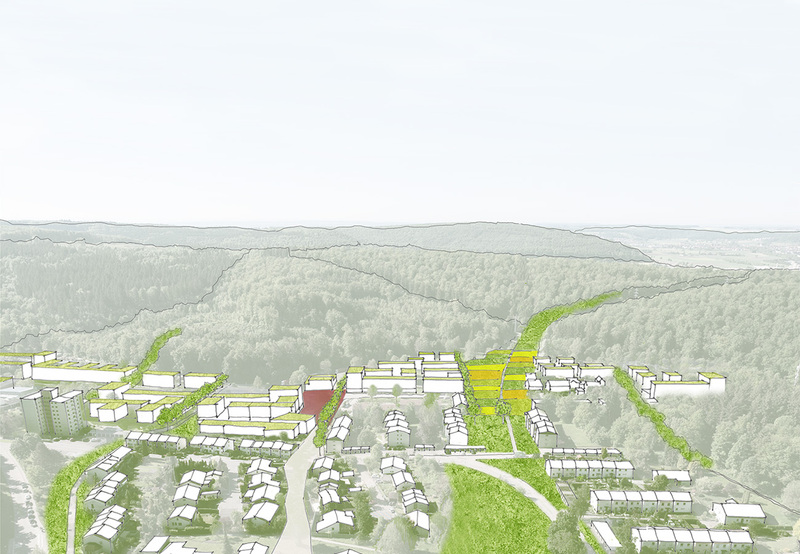 Gentle, deciduous wooded hills define the existing settlement from different time layers from the 1950s onwards. The existing quarter, characterised by terraced houses, detached lines and isolated higher spots from the 1970s, has few public and social meeting points. The main quality of the settlements is the direct access to the landscape. The planning area is further subdivided by two major caesuras: First, the country road in east-west direction with an adjoining dry ditch, which is very busy at peak times. Secondly, the high-voltage line in a north-south direction and unobstructable area with underground water supply lines. The area thus presents itself as areas lined up on both sides of the country road with no internal connection. Towards the edge of the forest, very narrow areas that are difficult to build on make continuous construction of the new quarter difficult. 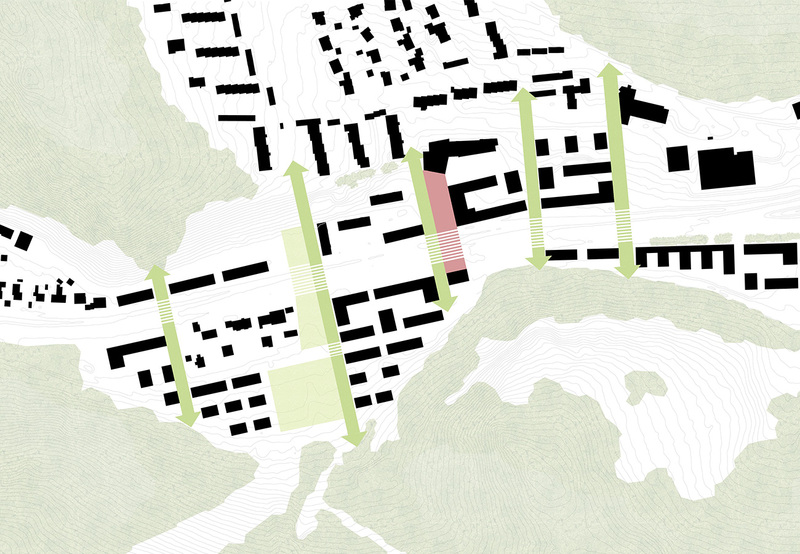 Landscape area: Along the high-voltage line and the existing water pipeline, the construction ban zone, previously perceived as a remaining area, is strengthened and positively reinterpreted as a green corridor. 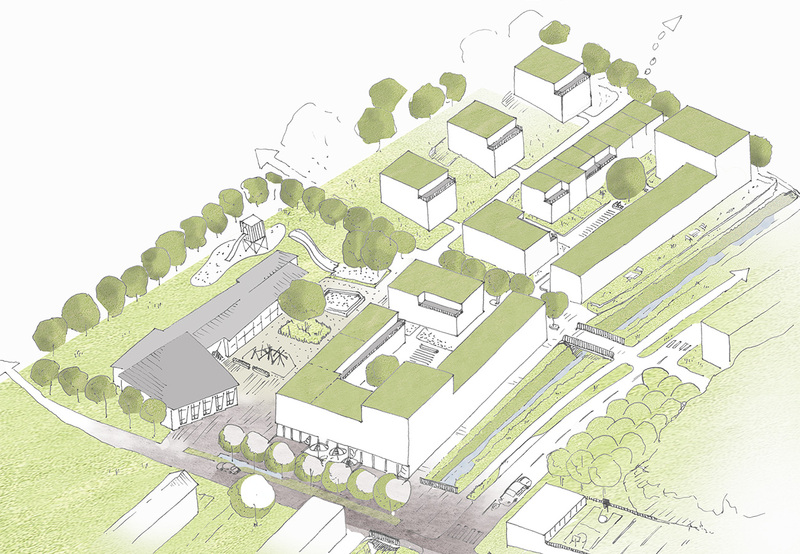 The grown landscape is led through the entire settlement, terraced with a cultural landscape identity and programmed selectively with leisure functions. The forest areas on both sides of the valley are thus visually and functionally connected. 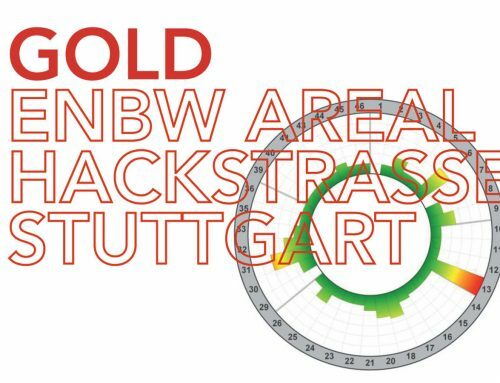 Urban belt: Starting from the cultural monument of the former Voith Bildungswerk, another important public space opens up. As a counterpart, another special building element is placed on the other side of the street. 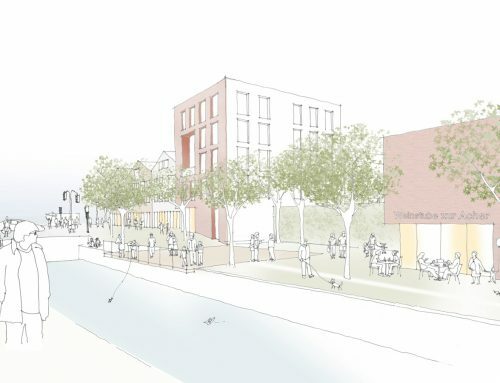 In order to strengthen the urban character in this area, smaller businesses and supply functions will be located in the ground floor zones in the vicinity of both special building elements. Between these two corridors, the existing network of paths is supplemented by further pedestrian connections accompanied by rows of trees, which develop from the surrounding stock. Starting from the forest edges, these are led through the new and existing areas and generate a network of landscape and buildings that creates identity. 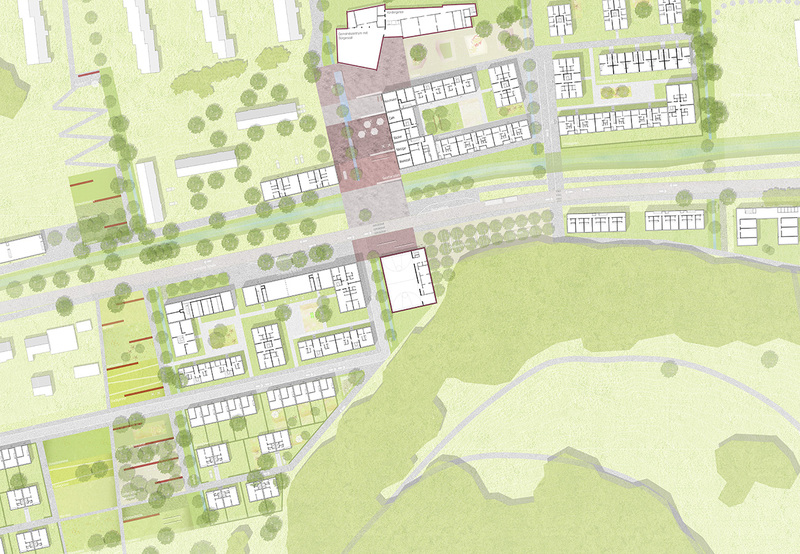 Communities Four clearly legible sub-areas develop between the two open spaces, each of which refers to the superordinate spaces and thus establishes the connection of the settlement. An average building height of three storeys and the spatial setting of the high points support the area as a unit. 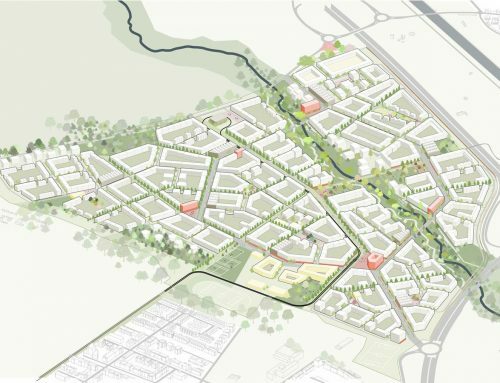 At the same time, communities are formed from the specific character of each quarter, which are characterised by different typologies and supplementary housing offers. Residential diversity The divergent construction methods require a diverse range of residential typologies and residential units of different sizes for a mixed population structure. In addition to multi-storey apartments and subsidised apartments, micro-apartments and inexpensive rental apartments for single parents are also offered. Terraced and semi-detached houses are particularly suitable for young families. 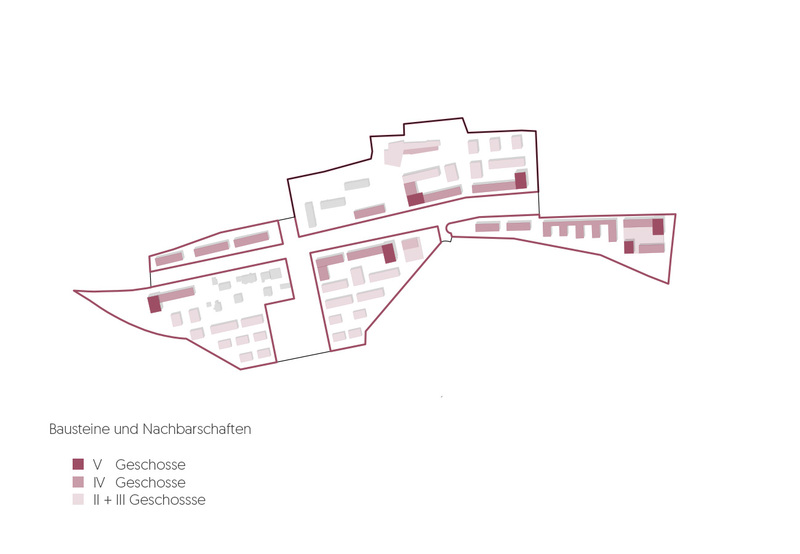 Generational living is offered centrally on Quartiersplatz, while free-standing point houses to the north of them facilitate innovative and collaborative living concepts for joint residential projects and building communities. The wide variety of typologies in different market segments with flexible layouts enables the integration of individual needs and lifestyles. Special building elements The current school is considered to be the founder of identity and impulse generator beyond the region. 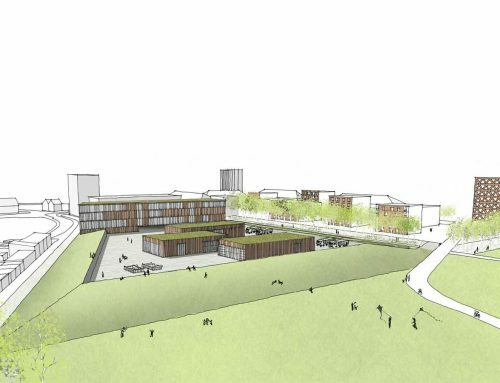 In this listed building, a day care centre, a community centre and a multi-functional playable hall will be located. Opposite this building is a sports hall placed in the topography with an attached youth centre. In the ground floor areas of important urban spaces, common rooms for the neighbourhood, co-working spaces and commercial uses are planned.